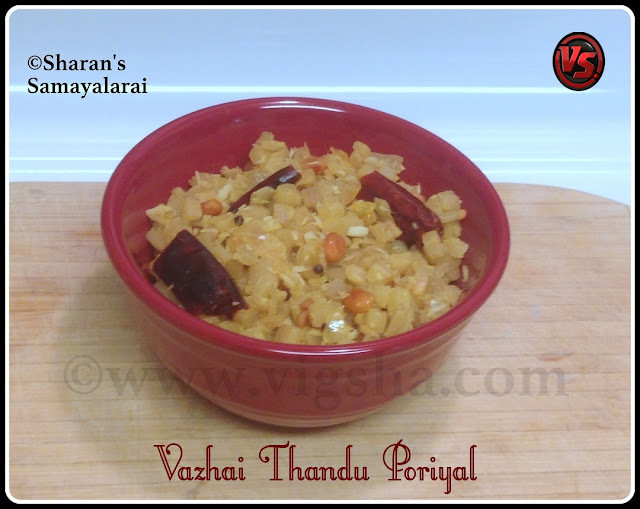 Vazhaithandu Poriyal is a healthy and simple rice accompaniment. It is one of my favourite since my childhood days. Vazhaithandu (in tamil) is also known as Banana stem | Plantain stem |Plantain shoot. Banana stem is an edible part of banana tree, that is rich in dietary fiber. Since it is high in fiber, it acts as a laxative, and can ease constipation. It also helps in overall functioning of the digestive system. After harvesting the Banana bunch, the tree will be cut as it can fruit only once in its lifetime. Tree consists of layers which can peeled like onion. Finally you get a cylindrical shaped soft shoot. All the parts of the banana plant are good for health. Right from the flower, raw banana, ripe banana to its stem. I have loads of memory associated with this Vazhaithandu. I remember my grandmother cleaning and chopping the vazhaithandu. All those memories stay fresh even now and I always cherish them. After coming to US, I noticed it in Indian stores only once, when my parents were with me. Mom prepared this poriyal for us and it re-kindled my memories. 1). Remove the outer shell, covering the tender plantain stem and discard it. Slice the tender stem into thin discs, removing the thread like fiber with your finger (roll them on your fingers). Chop the discs into small pieces. Keep the pieces immersed in buttermilk(water mixed with the beaten curd) to prevent discoloration. 2). Dip a wooden skewer in to the chopped banana stem and swirl it. When you take the skewer out, it will be coated with fiber(looks like thread). Remove the fiber from skewer and repeat the process until you don't see any traces of fiber. 3). In a sauce pan, add the chopped banana stem, salt, and water till immersing level. Cook until the pieces are soft, then drain and set aside. 4). Heat oil in a pan, add mustard, channa dal, urad dal and let them splutter. Then add the onions, red chili, salt and saute till onions turn light brown. 5). Then add turmeric powder and saute till the raw smell goes. Add the cooked banana stem and saute for a couple of minutes on low flame. Check for salt, finally add grated coconut, give a quick stir and switch off. Serve with sambar, rasam or curd rice. # Initially, you will feel pre-preparation process (cleaning & chopping) is cumbersome. But once you know the technique, you can finish it quickly. # Before chopping, grease your fingers with oil to prevent discoloration. # You can also drink the buttermilk after draining the banana stem pieces. Though it tastes bitter it is loaded with nutrients. If consumed in empty stomach, it helps for weight-loss. # While selecting the banana stem, look for a white stem, which indicates that it is fresh. Make sure to use the banana stem as soon as you get it from the market. i.e, within a day or two. # Avoid adding more water for cooking the stem. It is already rich in water.